Here at 121 Home Furniture, we have a selection of gorgeous Oak Beds, supplied by one of the leading home furniture companies in the UK - Julian Bowen. 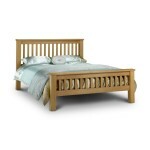 These beautiful Oak Beds bring an understated elegance to the bedroom. 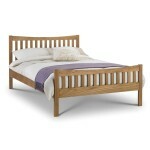 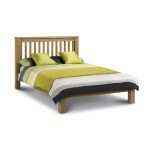 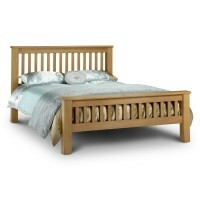 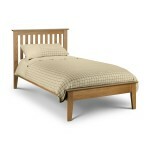 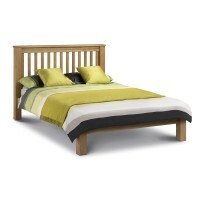 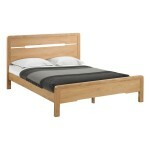 The Oak Beds that we have available come in single bed, double bed, king bed and super king bed sizes. 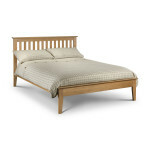 All our beds come with the option of multiple mattresses from your standard coil sprung mattress to supreme orthopaedic mattress and memory foam mattress to ensure you get the best nights sleep. 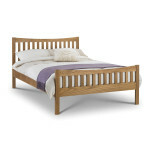 You spend nearly a third of your life sleeping so it's important to choose the right bed and mattress so that you can sleep in comfort. Julian Bowen Bergamo 135cm (4ft6) Double Bed BER201 Contemporary 135cm / 4ft6 Oak Bed The Bergamo is a beautifully simple bedstead crafted from solid oak that will last for years to come..
Julian Bowen Bergamo 150cm (5ft) King Size Bed BER202 Contemporary 150cm / 5ft Oak Bed The Bergamo is a beautifully simple bedstead crafted from solid oak that will last for years to come. 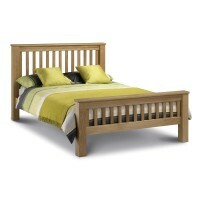 ..
Julian Bowen Salerno 135cm (4ft6) Double Bed SAL102 - Oak A Beautiful Solid Oak 135cm / 4ft6 Bed Salerno is a timeless shaker styled bed with refined detailing constructed from solid America..
Julian Bowen Salerno Shaker 150cm (5ft) King Size Bed SAL103 - Oak A Beautiful Solid Oak 150cm / 5ft Bed Salerno is a timeless shaker styled bed with refined detailing constructed from solid ..
Marlborough Oak Double Bed 135cm (4ft6) by Julian Bowen HFE AMS001 Contemporary 135cm Shaker bed Made from solid oak and oak veneers High Foot End Robust bed with a ful..
Marlborough Oak Double Bed 135cm (4ft6) by Julian Bowen LFE AMS004Contemporary 135cm Shaker bed	Made from solid oak and oak veneers	Low Foot end	Robust bed with a fully sprung slatted sleeping bas..
Marlborough Oak King Size Bed 150cm (5ft) by Julian Bowen LFE AMS005 Contemporary 150cm Shaker bed Made from solid oak and oak veneers Low foot end Robust bed with a fully sprung slatted..
Marlborough Super King Oak Bed 180cm (6ft) by Julian Bowen HFE AMS003 Contemporary 180cm Shaker bed High foot end Robust bed with a fully sprung slatted sleeping base Comes Flat Pa..
Marlborough Super King Oak Bed 180cm (6ft) by Julian Bowen LFE AMS006 Contemporary 180cm Shaker bed Made from solid oak and oak veneers Low foot end Robust bed with a fully sprung slatt..
Oak King Size Bed Marlborough 150cm (5ft) AMS002 by Julian BowenTimeless shaker design with extremely robust construction	Crafted from a combination of solid American white oak and real oak veneersSum.. Double Beds - Curve Oak Double Bed CUR208 - 135cm, 4ft6Constructed using solid white oak and oak veneersrecessed handle styled headboardSolid wooden slatted baseCurved edgingA sprung slatted base ensu..
King Beds - Curve Oak King Size Bed CUR209 - 150cm, 5ftConstructed using solid white oak and oak veneersrecessed handle styled headboardSolid wooden slatted baseCurved edgingA sprung slatted base ensu..